Our team is made up of extensively trained dentists who put patient comfort, results, and safety first. Our compassionate approach is designed to put you at ease and give you the confidence to achieve your smile goals. Get to know our dentists a little better by reading about their backgrounds, and please reach out to us with any questions you may have. A cosmetic dentist is a licensed dentist who has elected to complete additional training performing aesthetic enhancement techniques and treatments. Certain procedures require supplementary education beyond the basic courses provided during dental school. Porcelain veneers, teeth whitening, dental implants, and sedation dentistry options demand a level of skill that can only be achieved with continuing education. We are proud of our dentists’ commitment to learning and to staying at the forefront of the dental industry. Finding the right dentist for your needs and goals can seem like an overwhelming task, but it doesn’t have to be. The best way to identify a skilled, gentle, and extensively trained dentist is to schedule a consultation. After reviewing someone’s educational background, the consultation is the best way to get a feel for a dentist’s patient philosophy and demeanor. Are they happy to answer your questions? Can they offer suggestions to achieve your desired outcome? Do they provide alternatives if appropriate? Feeling comfortable is important, since you will likely be seeing this dentist regularly. With cosmetic dentists, you should also ask about how often they perform the procedure you’re interested in and whether it’s a good fit for your needs. 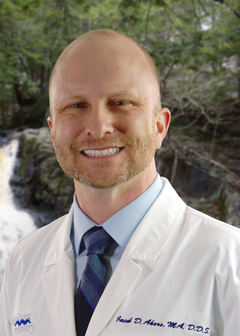 Dr. Nicholas Roy was born and raised in Lewiston, Maine. Growing up he enjoyed playing hockey, running and track and field. He attended UVM for his undergraduate studies. Upon completing his B.S. in Chemistry, he headed south to The University of Connecticut School of Dental Medicine, a top-rated dental school. The four years flew by and there was lots learned. During this time, he developed a passion for comprehensive care, which is a style of dental treatment that looks at the big picture of a person’s mouth and related systems, along with their overall systemic health. In order to help patients with such complex needs, he decided to enter an Advanced Education in General Dentistry (AEGD) in Richmond, Virginia. This experience gave him the confidence and skills necessary to do implant dentistry, full mouth rehabilitation, sedation dentistry, and complex surgical treatment. Returning to his home state, he decided to help those in need by joining a public health facility. This gave him time to give back, while evaluating where he’d like to plant his roots. A chance encounter led him to join Dr. Wayne Lopez and Dr. Jin Hwang. Dr. Lopez had built a very quality patient base in Gorham in the 1970s-1990s. Dr. Lopez moved to Buxton in 1999, in a house built in 1812. Although this house was excellent for a dentist in the final years of their career, it could not support the efficient and comprehensive care Dr. Roy envisions for his patients. He acquired the practice in 2013 and began to craft the practice of his dreams. Dr. Roy has a passion for Continuing Education in Dentistry. He is a member of the American Dental Association (ADA), Maine Dental Association (MDA), American Academy of Implant Dentistry (AAID), Board Member and President Elect of the Maine Academy of General Dentistry (ME AGD), President of the New England Master Track Program (NEMTP), Past President and Vice President of the Greater Portland Dental Society (GPDS), member of the Greater Portland Dental Study Club (GPDSC), and recipient of the prestigious Fellowship in the Academy of General Dentistry (FAGD). 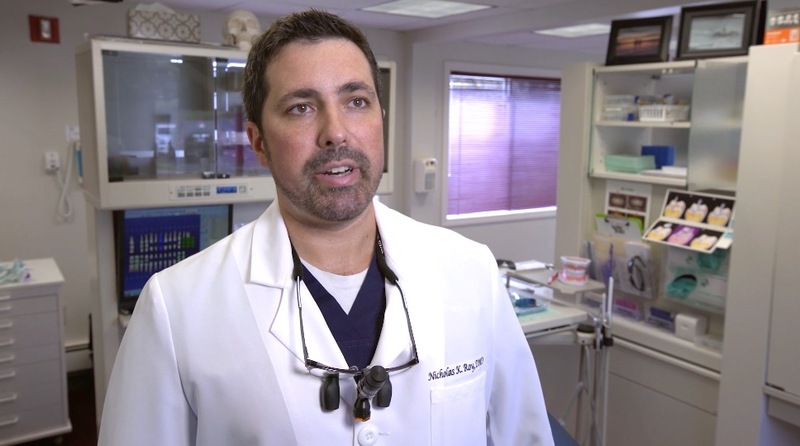 He has lectured to his peers at local dental meetings and was featured in the leading dental podcast in the world, discussing his passion for dental adhesives and continuing education. Dr. Roy’s goal is to provide dental care in a comprehensive manner. This means he will focus on patients that have been away from the dental world for some time, and have a complex set of issues. He looks forward to continuing to be a big part of the community, mission trips to Honduras, and teaching at University of New England (UNE) Dental School. Dr. Roy has a passion for golf, hockey, running, fishing, hiking, and playing guitar. He enjoys time with his wife Danielle and their dog, Neely, a silver lab. For a glimpse of Dr. Roy’s dental work, see the smile gallery! 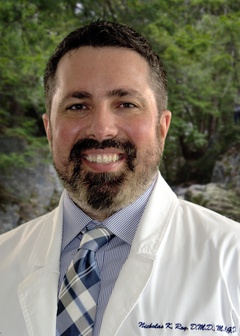 Dr. Kristian Richardson joined the Saco River Dentistry Team in 2016. She was born in New Brunswick, Canada. After Graduating from Dalhousie University Doctor of Dental Surgery (DDS) program in 2011, she moved from Halifax, Nova Scotia to Maine to pursue the American Dream. Originally, she intended to move back to Canada to take over the family dental practice but absolutely fell in love with Maine and its people. She is currently working towards her M.A.G.D. (Masters in General Dentistry) to continue advancing her knowledge in dentistry. During the summer, you'll find Dr. Richardson and her family relaxing on one of Southern Maine's beautiful beaches and in the winter hitting the slopes at Sugarloaf Mountain. She enjoys her down time with her two sons, running, hiking, cooking, and relaxing with family and friends. Saco River Dentistry has given her the opportunity to provide patient centered care in a wonderful and caring practice. She loves treating her patients while connecting with them on a personal level. She looks forwards to meeting all patients at Saco River Dentistry. 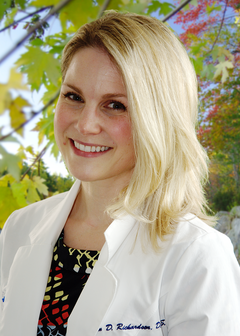 Dr. Joanna M. Fox was born and raised in Woodstock, New Brunswick, Canada. She is proud to be a citizen of both Canada and the United States. She graduated from the University of New Brunswick, Fredericton with a Bachelor’s of Science in Biology. During her time at UNB, she was a member and eventually captain of the women’s Varsity Reds basketball team. She then moved to Boston to explore her American heritage, and she graduated from Tufts University School of Dental Medicine. Tufts provided Dr. Fox with a fantastic foundation in clinical general dentistry, while ingraining the importance of being able to see and treat patients as a whole rather than just treating their teeth. Living in Boston left Dr. Fox longing for the wide-open spaces of Maine, because she enjoys long dog walks, snowshoeing, and golfing. Dr. Fox is excited to be practicing with the wonderful team at Saco River Dentistry, and she looks forward to meeting you! Dr. Jacob Akers’ family moved to Denmark, ME in 1996 after spending several summers and vacations there. His dental passion was first ignited during a Baptist medical missions trip to La Romana, Dominican Republic in 2012. Shortly thereafter, he attended dental school at Virginia Commonwealth University and graduated in 2016. Shortly thereafter, he attended the prestigious AEGD-1 (Advanced Education in General Dentistry) residency at the Veteran’s Administration Hospital near Fort Bragg, NC gaining experience with more complex dental and medical treatments. Upon completion, his family, including eight nieces and nephews, drew him back to practice in the scenic mountains of Maine. When he’s not playing uncle, Dr. Akers enjoys the outdoors in any capacity, photography, cooking, reading, coffee, and traveling with his lovely girlfriend. Lastly, Dr. Akers has the privilege of serving as a dentist with the New Hampshire National Guard and aiding soldiers towards improving their comprehensive oral health on and off the field. He looks forward to meeting the patient’s of SRD where they are and setting a path that works best for them. 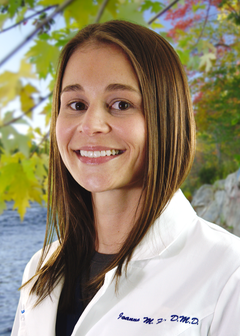 After graduating from UNE College of Dental Medicine, Dr. Reagan joined the Saco River Dentistry team. Although he wishes he could call himself a native of Maine, he has lived in and loved this great state for fifteen years and cannot imagine calling anywhere else home. After graduating from Susquehanna University with a B.S. in Biology, Dr. Reagan received a master’s degree in Human Anatomy and Physiology at the Pennsylvania State College of Medicine. It was during his time there that he developed an understanding and appreciation for the ways that the oral cavity can influence the health and function of the human body; a stepping stone which led him to a career in dentistry. Dr. Reagan is a member of the American Dental Association as well as the Maine Dental Association. His main focus is providing his patients with a comfortable and supportive environment while helping his patients achieve a healthy and confident smile. In his free time Dr. Reagan enjoys reading, cooking, and yoga, but most of all spending time with his family; his wife, two-year-old daughter, and beautiful pug. 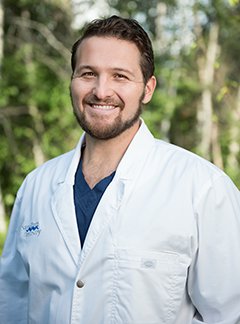 Dr. Reagan is extremely excited to be at Saco River Dentistry and is looking forward to getting to know you.